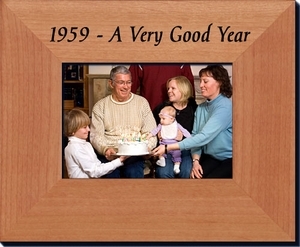 Home > 60th Birthday or Anniversary Gifts from 1959 > 1959 Frame - ON SALE! 1959 Frame. 60th Birthday Gift or Anniversary Gift . 1959 saw a burst of favorite television shows and movies including "Bonanza", "Rawhide", & "The Twilight Zone", "Ben Hur" , "Some Like it Hot", and "North by Northwest". If you're looking for a 60th anniversary frame look who else might be in need of one as well: Empress Farah and Shah Mohammed Reza Pahlavi, Julie London and Bobby Troup, Claire Bloom and Rod Steiger, Barbara Marx and Zeppo Marx (did he speak when he proposed? ), Peter Finch and Yolande Turner, Brigitte Bardot and Jacques Charrier, Eddie Fisher and Elizabeth Taylor, Julie Andrews and Tony Walton. If you're looking for that special 60th birthday gift frame, see whose picture would also fit in it: Lawrence Taylor (NFL linebacker), John McEnroe (world's angriest tennis player), Kevin Spacey (actor), Jason Alexander (comedian - Seinfeld! ), Sarah Ferguson (future, and now ex, Duchess of York), Paula Poundstone (comedienne). This 1959 frame will hold a 3.5x5 inch photo. The picture frame is made from alder wood and has "1959 - A Very Good Year" on it. See also our other 60th birthday presents.